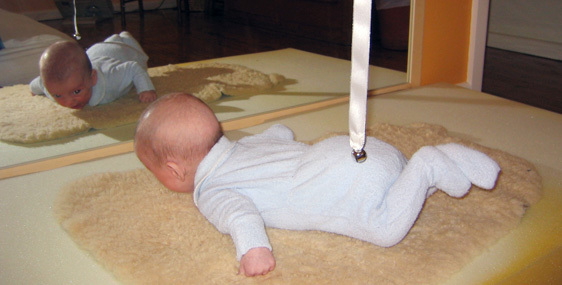 Place a thin mat for movement on the floor in any place where your baby spends time. This mat should be neutral in colour rather than highly coloured and patterned. This allows your baby to see the things that you place on it more clearly. Sometimes you can just lay your baby on his back to kick but make sure that you place him on his tummy for some part of every day. Being on his tummy will allow him to start to strengthen his upper body by pushing up on it. Let him practise these movements for at least ten minutes at a time or until he tells you he has had enough. Watch his movements and allow some time for him to make an effort before picking him up or turning him over.